Husky sledding is a great way to experience winter in Karelia in its most pristine beauty. This tour offers a unique experience to spend 1 night far from civilization in a comfortable tent in the Karelian forest. 07:00/ 08:30 Meeting at the railway station with the guide and transfer to the Karjala Park Husky Farm (30 km). Breakfast upon arrival. After breakfast you will get acquainted with huskies, which are one of the friendliest dog breeds in the world. 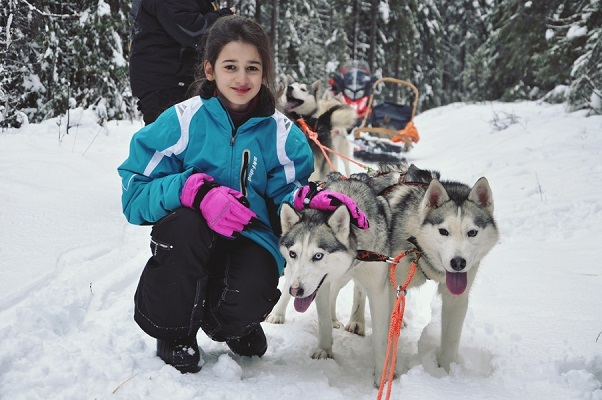 Your guide will tell you about the history of the breed, teach you how to harness huskies and how to prepare sledges for the ride, and give you full instruction in handling your sled and caring for your husky team. After the sledges are ready and the dogs are harnessed, begins a true adventure. Joyful huskies’ bark will break the silence of the sleeping Karelian forest and color it with vivid emotions. Today we are heading to the picturesque Kangasyarvi Lake. During our trip we will make a stop for picnic. After we reach our destination, the dogs will have some rest and we will explore the untouched winter landscapes of Karelian forest with snow shoes. In the evening we will enjoy hot dinner cooked over the open fire, share our impressions and enjoy the atmosphere of a winter night far from civilization. You can stay outside as long as you like to look at the night sky full of stars or even to witness the Northern Lights, if you are lucky, before you go to sleep in a big common tent. Today we cover the distance of 15 km to reach ancient Kinerma Village. Upon arrival Nadezhda, local resident of Kinerma Village, will meet us and get acquainted with the history of the ancient settlement. You will see solid houses made of huge logs, which are more than 100 years old, and feel the atmosphere of a true Karelian village. After a walking excursion you will have lunch in the farmer’s house with dishes of national cuisine. After lunch transfer to Petrozavodsk. accommodation in a common tent and meals according to the program, transfers, dog team, professional dog musher, English-speaking interpreter, insurance. backpack, comfortable clothes: pants, warm sweater, 2 pairs of woolen socks, 2-3 pairs of cotton socks, T-shirts, warm jacket, woolen hat, gloves, warm comfortable shoes.